My apologies for the site being down for part of yesterday; a little tweak by our resident programmer, Mad, had unexpected effects that I did not discover until after he had gone to sleep for the night. All is well again, as you can see, and we press bravely onwards. Over at Keith Collantine's F1 Fanatic site, we have been dreaming of which great circuits from the past we would like to see return to the calendar. There have been some excellent suggestions, including one of my favorites, Long Beach. In nominating this one, Keith mentioned the steep changes in gradient of the old street circuit and it brought memories flooding back of raging F1 cars leaping over the brow of a rise and then throwing out the anchor for the next tight corner. Memories indeed. But in recalling those scenes, it occurred to me that modern F1 cars might not take so easily to such a bumpy and variable track. These days, almost every circuit on the calendar receives its fair share of criticism for its bumps and lumps yet, were we to drive around modern tracks in our family hatchback or runabout, we would be amazed at how smooth they are. It's all in how hard your suspension is and how much travel it's allowed. Racing has always required a harder suspension set up than road cars but things have reached an extreme stage now. Run over a pebble and you feel it. I wonder if we're getting things the wrong way around. 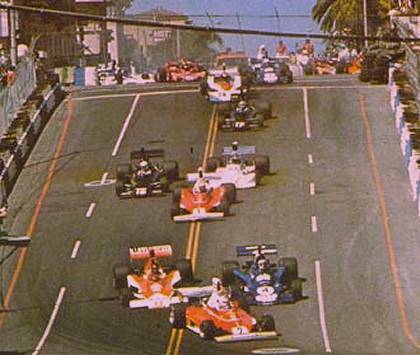 There was once a time when all races were run on public roads and the cars had to cope or expire (most of them expired, admittedly). When that became too dangerous, dedicated tracks were built and we began this current trend of designing circuits for the cars, rather than throwing a circuit at the constructors and saying, "There, design a car for that." Nick Heidfeld's recent few laps of the old Nordschleife circuit at the Nurburgring was a perfect example of how track design has changed over the years. Formula 1 last raced on the circuit in 1976 and the BMW engineers had to set the car up with maximum ride height to enable it to get round. Even then, Nick was told to take it easy and stay off the banked part of the Karousel. So now we design circuits that are silky smooth and still the drivers tell us about the bumps. How would they feel if confronted by something like the Flugplatz at the old Nurburgring, as pictured above? Would a modern car's suspension cope with the landing from such a jump and could the driver's spine survive intact? It took immense courage to approach the Flugplatz and keep your foot hard on the accelerator, even in those days; are there similar challenges available today? I am not suggesting that we go back to anything quite as dramatic as the Flugplatz; even an old fogy like me can recognize that it demands too much of the high tech monsters of today. But perhaps we have gone overboard in expecting the circuits to suit the cars, rather than the other way around. After all, asking the constructors to design cars that can handle circuits as bumpy as Long Beach, as well as the smoothies like Magny Cours, would bring out the best in them and might just keep the escalating speeds down a bit. And that is one of the things the FIA is always wanting to achieve, isn't it? Ah the Nordschleife! It'd be great to see the modern f1 cars falling apart around the green hell. I know this has been brought up and would never happen due to safety concerns, but I would like to see at least one more USGP at Walkins Glen.The concrete patches on a majority of the turns would cause havoc for next years traction control-free cars and the banked corners would put suspension pieces to the test.The only concern here of course be the safety of the drivers and a lack of overtaking. It seems a very narrow course with a very tight line. Yet with cars slipping and sliding all over a driver with a steady foot could make up quite a few positions. Safety is something of a conundrum in motor racing. How many tracks have been scrapped or dumbed down due to concerns for the drivers? Yet by doing this it makes the sport that much less exciting. We watch because we admire the courage and bravery on display, risking life and limb for our entertainment. Without risk there is no reward. Not to be morbid, but F1 was in it Golden Age when a death on a race weekend was tragic but not unexpected. I, too, would like to see F1 return to the Glen, Dan, although I doubt it will ever happen. Can you imagine the improvements old Bernie would demand before he even considered it? 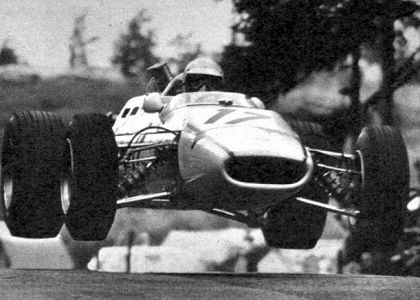 Stirling Moss once made the comment that without the danger, motor racing would be pointless. And he has a point. Although I don't think racers do it for our entertainment (I think it is more to do with the need to prove oneself the best), the resultant competition is given meaning by the fact that there is still danger. Without it, we might as well just put the drivers in simulators and let them fight it out there. The problem is in getting just the right balance. I don't think anyone wants to go back to the days when there were deaths and injuries almost every week but there is a point in making things safe beyond which it becomes ridiculous to continue. It may be that Kubica's Canadian accident demonstrates that we have reached that point, at least for the moment.